Taras Shevchenko Place, New York, New York. Photo: Adriana Farmiga, October 6, 2015. In conjunction with “Class Dismissed,” a discussion about art school, USC, and Cooper Union in the October issue of Artforum, here artist Adriana Farmiga discusses her views as a former undergraduate student and current adjunct faculty at Cooper Union. 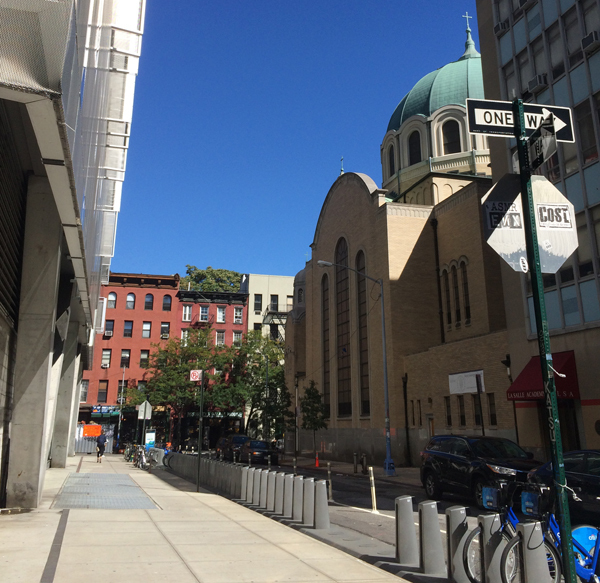 TARAS SHEVCHENKO PLACE is a curious site in the East Village: its formalism offers no shortage of metaphors. Looming on the right is the loud, new building of the Cooper Union, a bellwether for the current and seismic shifts in academia. To the left is Saint George’s Church, a spiritual anchor to a community of Ukrainian immigrants who settled here largely to escape political and cultural oppression. In between, you will find restricted parking, the occasional pot smoker, and a Citi Bike station, all on a one-block, one-way street. There’s little to add to what’s already been said about the importance of Cooper Union’s role in higher education, about the specious mismanagement of its finances, which led to the sabotage of its meritocratic mission, the longest students’ occupation in US history, a lawsuit, a president’s resignation, a settlement with the State’s attorney general, and ultimately, a victory towards a second chance. Because Cooper’s story speaks to the larger narrative concerning higher education in America, it makes sense to dwell on the idea of freedom. I am indebted to Cooper Union for giving me a debt-free education. By definition, when you have debt, you’re not free. The socio-political implications of this are myriad. The tuition-free education I received from Cooper Union was a gift. Yet the larger gift was seeing first-hand how a meritocracy functions in the classroom. Having taught in other universities, I can say with confidence that Cooper Union is a radical place—a pirate ship of sorts. Peter Cooper had swagger. He imagined an institution built on the belief that higher education shouldn’t come with a price tag. Without the burden of debt, it’s easier for a student to learn not just how to make and critique a work of art, but how to become a socially-minded, responsible citizen. When you lift the burden of debt, you ultimately lift the weight of fear, because that’s what true freedom is—no fear. When one can actually feel the difference free education makes it is pure magic. The movement to corporatize academia, including art education, is relentless. Most egregiously, it undermines the intellectual space an individual needs to learn the fundamentals of theoretical and abstract reasoning. Broadly, this push becomes a battle for scale, and that’s why Cooper’s story is instructive: because of its founder’s philanthropic mission, it was never meant to scale beyond its means. There’s nothing exceptional in what happened to Cooper. If anything, its exceptional mission made it more vulnerable to the predators of global branding and expansionist agendas. But if my students have taught me one thing, it’s that the undercurrent of resistance to this movement is extremely powerful. It’s younger, faster, madder, and it’s lateral; it knows how to organize, and how to disarm. No debt-embedded, corporate, educational glitz-machine can stop it. Returning to site, a block away from the imbroglio of Taras Shevchenko Place, sits the Foundation Building of the Cooper Union: a freestanding structure, an island unto itself. A freestanding work enables us to examine its relationship to the space and world around it. It’s now my privilege to participate in the continuation of the Cooper narrative, where it returns to its full-tuition scholarship mission as it has been legally tasked to do, and as a freestanding institution, once again becomes the example of what higher education can and should be. Adriana Farmiga is a Ukrainian-American artist, curator, and educator based in New York. She has taught at Cooper Union since 2011. She also serves as a programming advisor for the non-profit La Mama Gallery.